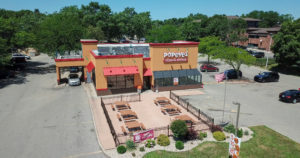 Quantum Real Estate Advisors, Inc. completed the sale of a freestanding 4,442-square-foot Popeyes at 2844 Fish Hatchery Road in Fitchburg, Wisconsin. The property sold for $2.88 million.There were about 20 years left on the lease at the time of sale, which was the longest Popeyes lease on the market. The seller was a Chicago-based developer who specializes in acquiring and developing net lease properties. The buyer was a private individual based in Seattle.Both Chad Firsel, president and Zack Hilgendorf, vice president, of Quantum Real Estate Advisors, Inc. represented both parties in the transaction.